The holidays are fast approaching and we can’t believe that Thanksgiving is less than two weeks away! This time of the year is always special because our homeowners enjoy getting together and spending time with loved ones and neighbors. Whether it’s the delicious smells in the kitchen, watching football or the parade on TV, or playing games, it’s all about making memories that will last a lifetime. We believe it’s how you live that matters, and it’s so great hearing all of the wonderful stories about the holidays from our homeowners. This year, why not get a little creative with your Thanksgiving plans? Fun Crafts: Get the kids involved in Thanksgiving by making cute DIY turkeys made out of pinecones! The only materials you’ll need are brown pipe cleaners, pinecones, colored feathers, googly eyes, and glue. Southern Living Magazine has a step by step tutorial, and once the children complete their festive masterpieces, you can hang them around the home. Festive Décor: You don’t have to break the bank to make your Thanksgiving celebration a great one. One cool idea is to make your own Thanksgiving centerpiece out of small gourds. 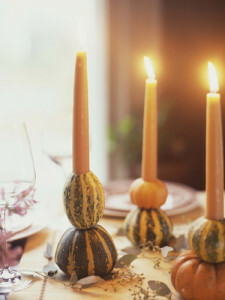 Hollow out the middle of a couple miniature gourds and pumpkins, and then slide in a candlestick for a seasonal look. They take a couple minutes to make and you can keep them for Thanksgiving next year as well! Delicious Recipes: One of the best things about Thanksgiving is all of the amazing food! Traditional foods served on Thanksgiving include green bean casserole, corn pudding, and stuffing, but what about incorporating an out-of-the-box dish in your meal? Pineapple casserole is a non-traditional dish that is oh so delicious! Coming up with a new recipe each year could be a fun tradition! Now that we’ve shared our favorite tips for Thanksgiving, let us know how you celebrate. 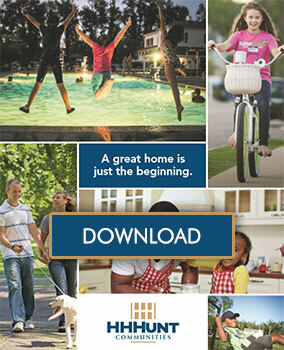 Comment on this blog post or share you go-to crafts or recipes on our Facebook page at https://www.facebook.com/hhhuntcommunities. We can’t wait to hear from you! We wish you the best as your prepare for Thanksgiving Day!